One week after China's richest man was allegedly taken from his home, there is still no official explanation about the reason for his detention either from the authorities or from the companies he controls. Reports from Beijing say police have confirmed Huang Guangyu was under investigation, but they have declined to give details. Mr Huang is a legendary figure, a living example of rising from rags to riches. Born into a poor family from the southern town of Shantou, Guangdong Province, in May 1969, he dropped out of school at the age of 16 and went to Beijing with his elder brother. Together they set up what came to be known as the Gome stall, selling home appliances. 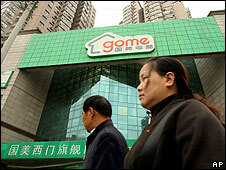 Gome soon grew to become the largest electronics retailer in China. 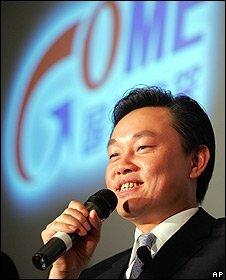 Listed on the Hong Kong Stock Exchange - where its shares remain suspended pending further clarification on Mr Huang's latest encounter with the police - Gome now employs some 300,000 people to work in more than 1,000 branches in 280 cities across China. For every six home electronic products bought, one is sold by Gome. Mr Huang later diversified into the lucrative market of real estate development and investment consultancy. His entrepreneurship has earned him the nickname "China's Sam Walton", after the American who established the Wal-Mart supermarket chain. In October, Mr Huang came top of the rich list compiled by the Hurun Report for the third time, with a personal wealth of RMB¥43 billion ($6.5bn, £4.2bn). It is his apparent wealth, and the means he has to gain it, that have put Mr Huang in the spotlight. Some Chinese reports say the investigation is linked to alleged stock market manipulation involving Jintai, a company controlled by his brother. Unusual share price movement in Jintai between February and August 2007 caught the attention of the China Securities Regulatory Commission (CRSC), which is trying to clean up the stock market in preparation for further government intervention to prop it up. Others suggest more complicated problems, including allegations of bribes being paid to officials in the commerce ministry and large sums of irregular loans from a state bank. The Huang brothers have been called in for questioning about the loans before. Officials from the CSRC say the nature of their joint enquiry with the police will have to be decided in accordance with the evidence available. The mystery of Huang Guangyu's fate has aroused some sympathy towards him, as an entrepreneur from the private sector. While questioning his integrity in the early days of empire-building, some observe that many private entrepreneurs have had to commit "sins" to develop further. They argue that the authorities are to blame for not creating a level playing field in the first place. Some of Gome's creditors and suppliers are also publically supportive of the company because business is harsh due to the global financial crisis. Any disaster for Gome would invariably have an impact on them. In private, however, they have started to take stock of their relationship with the troubled retail giant. It looks as though it is in a very precarious position. Still others question the authorities' wisdom and the legality of withholding information on the current investigation as the fate of China's richest man is inextricably linked to the thousands of employees and millions of small investors who have bought shares in the companies involved. They need to come to a decision about what to do with the shares. If Mr Huang is found guilty by the investigations, it could be the beginning of the unravelling of a legend and his empire.